JIM VEST and GREAT TIMES with Radioman Gibb Sunn at the NTSGA Superjam January 3rd, 2008 Preston Hotel, Nashville. Gibb: Ladies and Gentleman, Radioman Gibb Sunn with you welcoming one of the all time greats of Steel Guitar, Jim Vest. Great player, songwriter, producer, … Jim Vest, you do it all. Vest: You’re mighty kind Gibb, and we’re havin a good time tonight, right here at the NTSGA Superjam. They sound great in there. What we gonna talk about today on the old radio?? Gibb: Jim a lot of people out there don’t know where it all started for you. Gibb: DAVID HOUSTON, one of your heroes, and mine too. Vest: I said “I’d like to work for him someday”. I don’t know how I did it, but somehow within 6 months I was working for David, and stayed that way for about 2 years. And I was just listening to Doyle Grisham play here tonight and he’s so great on Steel, but back then he was playing lead guitar and I was playing Steel. Then the wife and I had a baby girl, and we had moved to Nashville. It was the last part of ’68, first part of ’69, and I was trying to stay off the road, decided that I wasn’t gonna be burnin ‘em up in the studio, so I formed a group called the “NASHVILLE CATS”. We had that group for a long time, and we were fortunate enough to have everybody in the industry hang out with us. When I looked out in the audience to call someone up, there was George Jones or Willie Nelson or Waylon Jennings, and the list goes on from Johnny Cash on thru.. The real break was when PAYCHECK started hangin out with me. Johnny came runnin in one night, he said “Vest, I just signed with CBS and you’re gonna play on my records”. I said “Man, BILLY SHERRILL hangs out with me all the time, and I’ve heard that for two years”. He says, “It’s over with now, you’re gonna play on my records”. Well in the meantime one of the girls had come up with one of those things we called ‘pops’ called “Sunday Morning Comin Down”, and I couldn’t get CLIFF PARKER to tune his string down. So I just mashed my pedals and tuned my Steel string down to where I could play “Da Da Da Da … Bom” on that low string, and then we could do the song. Then I tuned the string back up and got to wiggling the pedal a little, and thought “Lordy, there might be something there”. So the first time I got to do a session with Billy Sherrill … I didn’t know what to do. I’m sittin there with Pig Robbins and so many great players, Billy Stanford, Bob Moore, the list just goes on and on, “A” team players. And I want their attention so bad I can’t stand it, especially Billy Sherrill. Paycheck had picked a song called “SLIDE OFF YOUR SATIN SHEETS” , matter of fact I’d helped him pick it. So it came up time to do that song, and I thought “Man I’m gonna turn down that string and see if I can do anything with it”. Of course, I got away with it, it worked, and Billy came out after we got it cut and he thought it was a guitar player that had hit that low lick on the guitar. I said “No, it was me” and he liked it, and that just tickled me to death. Well then he started payin attention to me, some of the things I was writing, and then David Chamberlain and I signed with him and started writing for him. And also he made me leader on most everything I did, so it gave me an opportunity for a lot of George Jones and Tammy Wynette … the list goes on. And it’s brought us to pretty much to where we are now. Gibb: Jim not to interrupt, but could we go back to Paycheck and Billy Sherrill for one more minute. How’d all this come about with “TAKE THIS JOB AND SHOVE IT” ?? Vest: Well I had been doin a few sessions with Billy, and this was actually the 2nd thing we had done with Paycheck. On Monday we had cut one of my songs called “Cotton to Satin” and I had gone to bed that night knowing that I had Paycheck’s next single, and Billy Sherrill was happy with it, Paycheck was all excited and said “That’s gonna be the title of my album !!”. Well the next day we were in the studio, and here comes an old boy into the studio with a leather jacket on .. and chains hangin all over it .. and hair hangin down, and I thought “I know that ole boy, but I can’t figure out who it is”. He says something to Billy, they go upstairs for awhile, and when they come back Billy says “I want you all to listen to this song, we’re gonna throw it on this session”. Well I didn’t pay much attention to the song, you know it sounded pretty crappy, there wasn’t too much to it. The about the 2nd time we played it through, the magic happened, and the 3rd time we played it, IT WAS THERE. I looked at Paycheck, and he looked at me, and I knew I didn’t have the single on his album anymore.. I had just lost my single to a song called “TAKE THIS JOB AND SHOVE IT”. But Lord, what an album to have a song or two on !!! Paycheck still did cut a few of my songs on other albums that he did. Gibb: Wow!!! Jim, let me mention a few other names that will conjure up some great memories. How about Vern Gosdin. 1st time I heard your version of “IF YOU’RE GONNA DO ME WRONG, DO IT RIGHT”; it chilled me to the bone, still does! Vest: Well, Vern IS a great singer, and we had been working with him out at Hank Cochran’s house, writing and putting a lot of those songs together with Max D Barnes. Bob Montgomery had just left Tree and gone over to CBS and signed him. And they used me on all this stuff. Bob became a friend real quick, and was so wonderful to me. Matter of fact most of the time whenever I played on one of those albums, he had the songs about done, had Vern on ‘em, and he said :”Now I’m ready for you”. And he’d sit down with the button in his hand and say “Now, you’re gonna play till you make me cry”. And that was the way it was. It was “:No, No, No”, then all of a sudden I wouldn’t hear anything and look over at him and I knew I had it. It was time to play. Vest: What a great man. He used to walk me to death every time we’d get in an airport. He was a long legged Texan, and just a wonderful man, and a wonderful singer. He sang so good.. Janie Fricke, I did her 1st album. I did a lot of albums while I was with him. Bobby Vinton, two albums with him. And while all that was going on, he called me downtown one day to a meeting with Bobby Vinton’s producer, and said “He wants a Country Act, and I think it’s you”, and offered me a deal with CBS. But I just didn’t see me as a singer, it was a long trip from that Steel Guitar to the microphone, and I said “I don’t think I can do it boys”, and I think it would have been a big mistake. Gibb: I got another memory to ask you about. You’re a great song writer too, don’t want anyone to forget that. 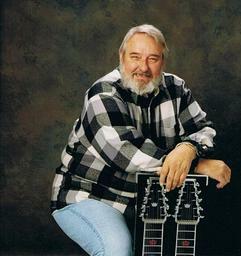 RON SWEET, in my opinion The Greatest Country Singer to Never hit the Big Time, did your song “Cotton to Satin”. When you got him that song, it was vintage Ron Sweet. Vest: What another wonderful man !! He called me one day, so excited, and said “Jim, would it be OK if I cut your song “COTTON TO SATIN”. I said, “what do you mean, I can’t wait to hear it”. So we got together and it was a wonderful cut. He had some great success with it overseas too. You know from time to time, I still get calls from DJs around the country saying “I play that song once or twice a week, just because of Ron Sweet and that song”. That really makes me happy. Vest: Well once again, about every 6 or 7 years, I’d tune that string down and had gone into do a session with Bob Montgomery, and there was guitar on it. And Bob said “You know what, the guitar played good … but it’s just not what I want. Would you just … Put a ‘twin’ with it Vest ?? No that’s not it, put a ‘pad’ around it, No, what’s wrong with me,. Engineer take the guitar off, … give me a Jim Vest Intro.” So I thought this might be the time, tuned the string down again, and said “better give me 5 minutes”. So Bob comes back, and I wanted pickup notes on the very front, but for some reason I wasn’t ready, so I just went straight into it. Well, soon as I played the turn-around, Bob went off like a fire cracker, hollers at the engineer sayin “did you get that’. I said “Let me replace that, I want to put pickup notes on it”. Bob says “You’ll never replace that on this record ! !” But when you hear the turnaround, I finally got a chance to put my pickup notes in there before I played the turnaround. Gibb: I get radio requests on the air for one of your great songs “I JUST DON’T FEEL LIKE CHEATIN WITH YOU” with SAMMI SMITH. What’s the story behind that ??? Vest: Another wonderful person, Sammi Smith worked for me in Printers Alley. She come to me one night and said “You know what, there’s some people tryin to get me a record deal”. I said “Get in there and get after it darlin’” She was so distraught, and tryin so hard, but just couldn’t get it to happen. Now this is sort of a funny story in a way, but I was getting kind of concerned about her. She was sort of quiet and distant and depressed. She says “would you take me over to this pancake house and drop me off, I’ve got some friends there” I said “what’s wrong with you, you ain’t actin right. I’m gonna wait here for awhile to be sure you’re alright” She comes out and says “There ain’t anybody in there I want to be with”. I said “I don’t make a habit of this, but we’re going to your house, get your pajamas and guitar, and tonight your stayin with me and my wife”. This is before cell phones, so I couldn’t call home, walked in the door about 3am and told the wife “We got company”. The next morning she was a totally different person, she was writing on a song and playin it for my little daughter. Later in her career, she was so gracious to do a song that David Chamberlain and I wrote called “I Just Don’t Feel Like Cheatin with You”. Sammi was a beautiful person, she was a great lady, we sure hated to lose Sammi, she gave us some great records. Another one, I don’t even have a copy of it, David and I wrote “Way down in the land of cotton, someone here has been forgotten” and DOTTIE WEST cut the fire out of it. It was just before she died, and nothing has happened with it. I’d give anything to get my hands on that. We all sure miss her. Gibb: “CAN’T BREAK IT TO MY HEART”, do you remember that ?? Vest: TRACY LAWERENCE, oh yes. There was a young boy that come to me and wanted me to do some demos for him. When he found out what demos cost, he realized he couldn’t afford it. But he had his foot in the door with me, and says “could I just show you some stuff every once in a while”. He shows up every other day !! His name was Elbert West and he was so poor he had a patch on both cheeks. He kept bringing me stuff, and I’d pull out what he called the “terrible magic marker”, and would make some changes. But then he’d go fix it. One day he comes and says “Jim I’ve got one you’ll like, and there’s a new boy named Tracy that’s singing it, and he’s wantin to see if he can get a record deal with it”. It was Tracy singin it alright, and it was called STICKS AND STONES. Elbert says “would you let him do it ? ?” I said “It’s yours, Elbert, not mine”. He says “Oh yeah, whatever I do is yours, you’re the only person in town that has reached a hand down to help me, nobody but you”. So I signed Elbert to a 5 year contract. Then we also had another thing called ‘Can’t Break it to My Heart”, and 4 or 5 other cuts while we made our run with Tracy. Thank you Tracy, did us a great job. Gibb: I know I’m wearing you out, but I gotta ask you about Alan Jackson. Vest: I get a call, it’s for an Alan Jackson session. We did a couple Country songs, but the main thing was a Christmas song. It was about 4 years ago. I remember what a wonderful guy he is, easy to work with, smiles, walks over and puts his hand on my shoulder and says “Man, I sure like your playin”. That makes you feel like a million dollars. And you know, his producer and his producer’s dad, have become great friends. Alan Jackson, one of our good ones for sure. Gibb: Jim, I want to give you a big hello from Big Jim Murphy, probably the best friend I ever had. You were Murph’s favorite guy, talked all the time about how great you were. Murph was playing Steel with Ron Sweet in the days of “BABY THAT’S COLD”. Always told me … “this Vest is one great guy, you’ve got to interview him on the air sometime”. Vest: I didn’t do the Steel on Ron’s album, thought it might have been Big Jim Murphy but you said it wasn’t him. I did do the one with Vern Gosdin, who also cut that song. Murphy and I go back to the early 60’s and God Bless You Murphy, I know you’re up there with Jimmy Day, Curly Chaulker, and all the great ones. Gibb: JIMMY DAY. Tell me just a little of your recollections with Jimmy Day. Vest: Way back before I was with Pee Wee King, I was in his record shop at least once a week, seeing what was new., and being absolutely sure I had every Ray Price record out there. I’m learning to play the Steel at that time. Following in the footsteps of Buddy Emmons, but more so Jimmy Day. I understood what Jimmy did, and he was one of the biggest influences in my life. Later on it was Pete Drake. A lot of people don’t give Pete Drake his due, but Pete was a great player. Pete knew how to play around a singer and make a great record. come in all the time. Soon as he’d walk in the door, we’d kick off one of his songs, and get him up. Wouldn’t even give him a chance to get a drink. Man, here he’d come in , and get up and sing with us. You know we had a lot of big names come through that Printers Alley club. I looked up one night and there’s PAUL McCARTNEY. Bartender catches me getting off the stage, and says “Go back there and say hello to Paul”. He was there with his wife and another couple, spent an hour with me, went up and had an hour set with BOOTS RANDOLF, and then closed the night with us. Beautiful people. I’ll never forget him sayin “Whatta Bond, Whatta Bond (he couldn’t pronounce ‘band’). Gibb: Jim Vest, what a great interview.. I know I’ve done wore you out. Talkin to you could be a lifetime endeavor. Thank you so much for coming over to the Preston Hotel tonight, and the Nashville Steel Guitar Association (NTSGA) Superjam. Legendary Jim Vest, always a true hero in my eyes, and every other Steel player in the universe.